Did you know that you can eat flowers? Many people grow flowers specifically to use them in salads, teas, cakes, and other foods. If you love flowers and are wondering how you might be able to enjoy them even more by eating them, you’ll definitely want to read on. Flowers can look and taste great, and they can be good for you. Many flowers, such as nasturtium and roses, contain powerful compounds that can bring you healing when you’re ill and keep your body healthy overall. The following 5 flowers are not only gorgeous, they’re edible, so you might want to get some for your home. You can grow all of these flowers in a garden and some of them will thrive indoors if you don’t have space outside. Enjoy these tasty flowers, their petals and their blossoms, in desserts, smoothies, syrups, and more. 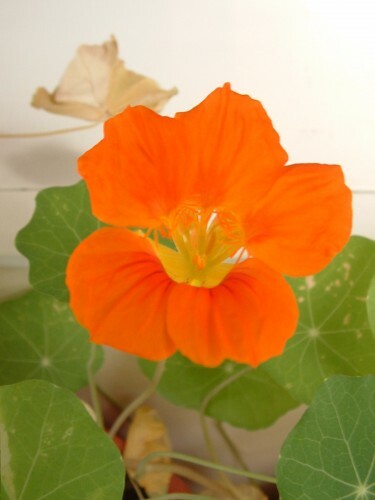 Nasturtium is an edible flower that has a peppery aroma and a spicy flavor. You can eat the entire winding part of the Nasturtium plant that sits above ground. Nasturtium buds can be pickled and eaten in any way you would consume capers. Elder tree blossoms are fragrant and they taste great when made into a tea, syrup, liqueur, jelly, or vinegar. We’ve even heard that elder tree fritters are divine. Some people don’t realize that you can take rose petals from your yard, or an arrangement of rose flowers that haven’t been sprayed with pesticides, and turn them into tea, cakes, desserts, and yummy beverages. Maybe you’ve seen candied violets on cakes and cupcakes. If you haven’t, check out a few photos because they’re stunning. While topping baked goods is a popular way to consume violets, you can utilize their beauty and sweet flavor in soups and salads. Some people think of English daisies as nothing more than weeds, but we feel differently about these tiny blooms. English daisy petals can be a pretty and delicious addition to sandwiches, salads, and even breads. Do you have experience with eating any other flowers? We’d love to hear from you in the comments below. We’re always excited to learn about new ways to enjoy flowers, so feel free to share your favorite tasty flower treats. Did you know that you can eat flowers? Many people grow flowers specifically to use them in salads, teas, cakes, and other foods. If you love flowers and are wondering how you might be able to enjoy them even more by eating them, you’ll definitely want to read on.Flowers can look and taste great, and they can be good for you. Many flowers, such as nasturtium and roses, contain powerful compounds that can bring you healing when you’re ill and keep your body healthy overall. I’ve always wanted to try dandelion cookies!